I love waterfalls. I was amazed to watch Niagara in USA, Agsthiyaar falls near Tirunelveli, India and Abbey falls in Coorg, India. 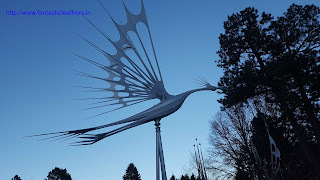 We visited 'Seven Falls' in Colorado Springs on a sunny day. 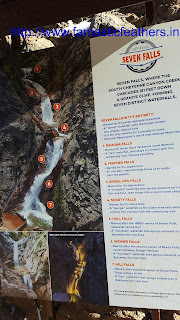 Seven falls is privately owned and maintained by Broadmoor group and it is a series of seven cascading waterfalls. 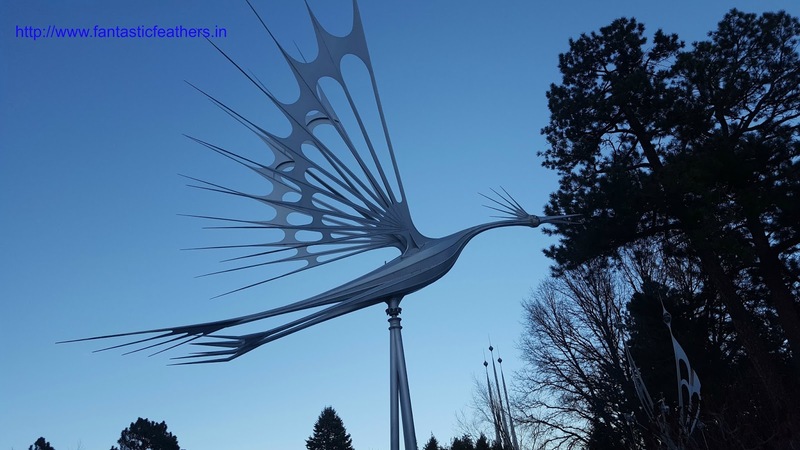 Even though we went on a sunny day, the South Cheyenne canon region is completely different. Since day light / sun rays cannot pass through the narrow road leading to Seven falls, it is freezingly cool. 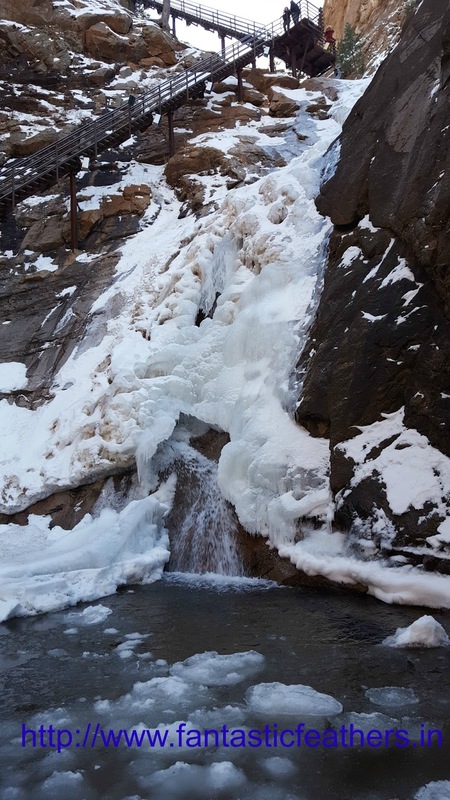 As expected, the waterfall is almost frozen. 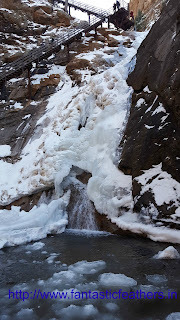 This is my first time to see a frozen fall and it is amazing. I think I will visit this place again in rainy season. There are around 224 steps to reach the top of the waterfall which is 181ft. There are rest areas in the middle to sit, enjoy the nature and capture the waterfall at various points of climb. It is difficult to climb those steps carrying a toddler, so we took the elevator to reach the top. 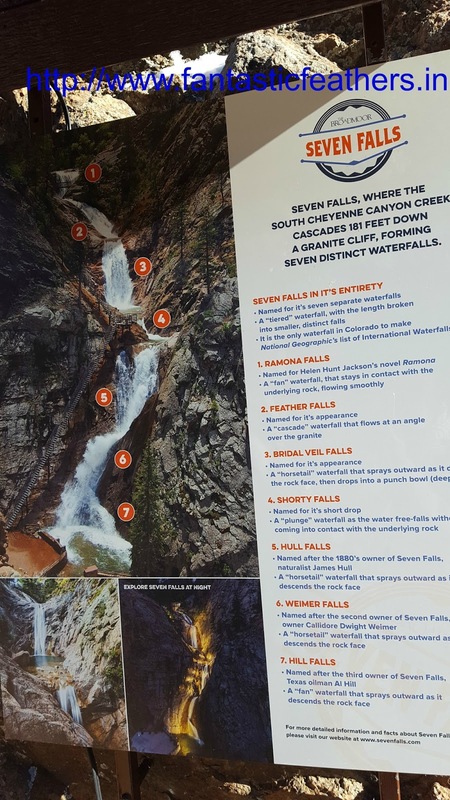 Seven falls is only one waterfall in Colorado which is included in the National Geographic list of international waterfalls. But, the waterfall is a very thin line, not a gushing waterfall. This disappoints many of the tourists. Seven falls are usually lit in the evenings and I heard the lighting looks great. Broadmoor operates buses to the waterfall from Broadmoor hotel and back. There is a restaurant 1858 at the foot of the falls to indulge in great dining. 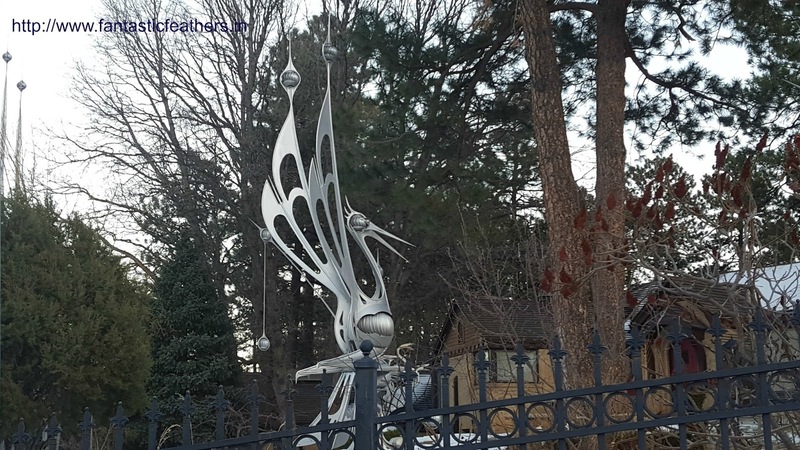 On the way back from Seven falls, there is a house which has some great metal sculptures installed outside. 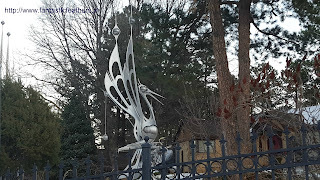 Though it is a private property, we can watch those metal birds with big wings in motion from outside. So, that's how we spent one day at seven falls. I have never seen a frozen waterfall... It must be so amazing to see it in real. Good they have provided elevator service too. I remember climbing up and down 1400 steps of jog waterfalls. That was something. Whaoo, frozen fall.must have been so mesmerizing.